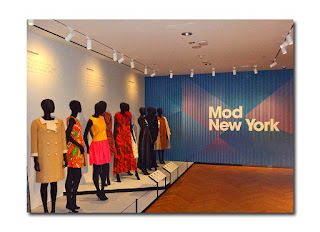 It's a mod, mod, mod, mod world at the Museum of the City of New York. If you haven't caught Mod New York: Fashion Takes a Trip (it opened right around Thanksgiving and may have gotten lost in the holiday shuffle) it' s worth checking out through April 1. 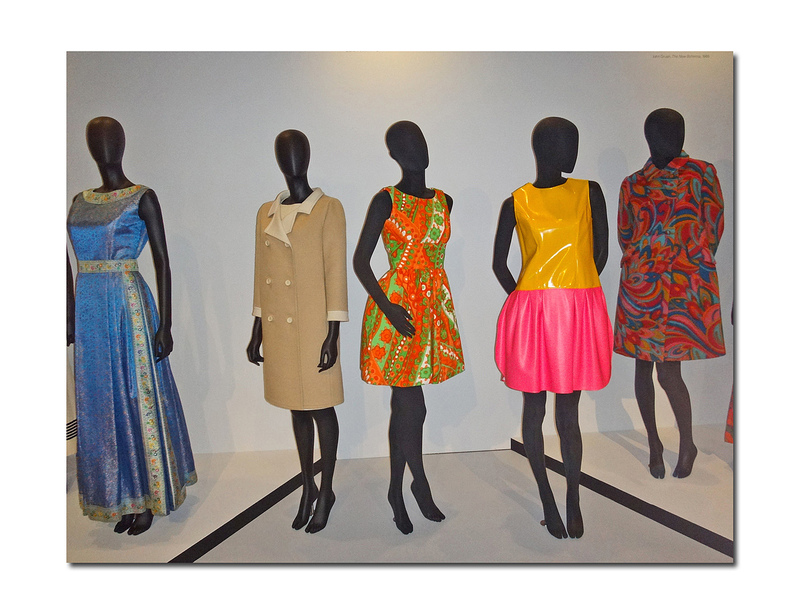 Highlighting one of the most interesting periods in American fashion history from 1960 through 1973, the exhibition categorizes four major styles: First Lady Fashion (1960-1963), Youthquake (1964-1966), New Bohemia (1967-1969), and New Nonchalance (1970-1973). If you happened to see last year's Paris Refashioned 1957-1968 at the Museum at FIT, this exhibition gives a look at what was going on concurrently here on Seventh Avenue. 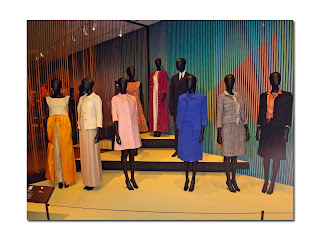 First Lady Fashion of course refers to Jacqueline Kennedy's chic and refined sense of style -- her Oleg Cassini clothes were interpreted from Paris couture. 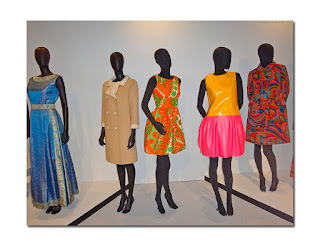 As American fashion of the early '60s evolved into simpler more freeing silhouettes, muted colors and less embellishment, many women adapted the "Jackie look" which was offered by American designers such as Norman Norell. Other elements of her style such as the bouffant hairdo, pillbox hats and pearl necklaces helped define the "American look." The so-called "Youthquake" encompassed a mid-1960's fashion explosion towards young trendsetters. 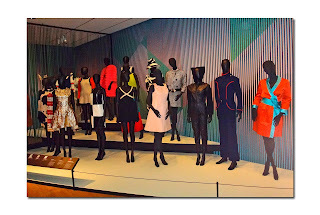 More established designers such as Donald Brooks as well as newbie Geoffrey Beene got on board with miniskirts, bold color and pattern, simple silhouettes that didn't involve supportive and restrictive undergarments, as well as textile innovations like vinyl, polyester, knits and even paper as seen with the Andy Warhol soup can paper dress. 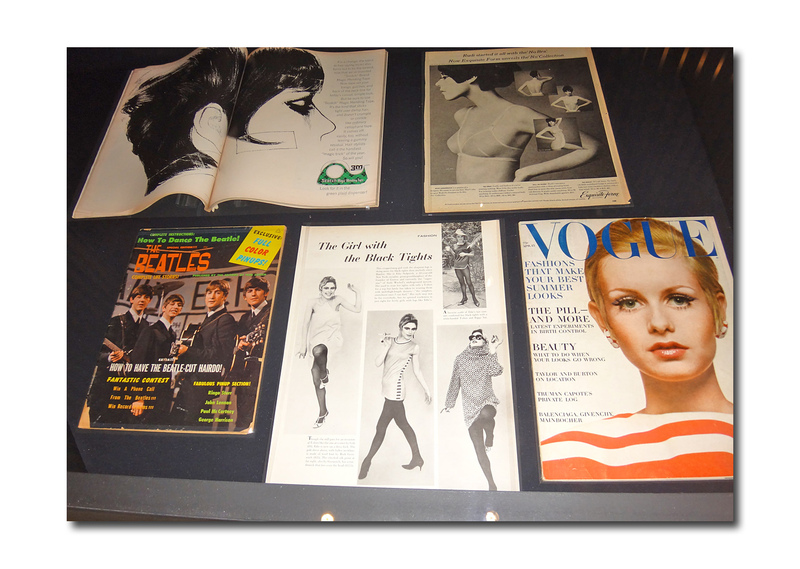 The Beatles brought the "British Invasion" -- designers such as Mary Quant and models such as Jean Shrimpton, and Twiggy. 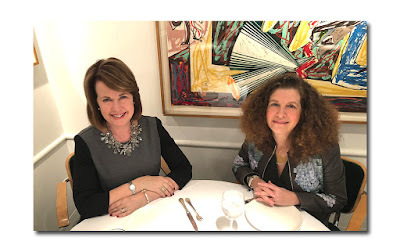 Boutiques like Upper East Side's Paraphernalia combined fashion, music and late-night parties beckoning to artist-celebrities as hang-outs. Pronounced the "Party of the Century," Truman Capote's November 28, 1965 Black-and-White-Ball at the Plaza Hotel has its own platform here. 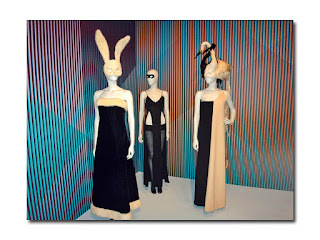 Life Magazine proclaimed it "the biggest and most glorious bash ever" as worlds collided between the traditionally elegant establishment designs of James Galanos and young avant-garde designers such as Betsey Johnson. 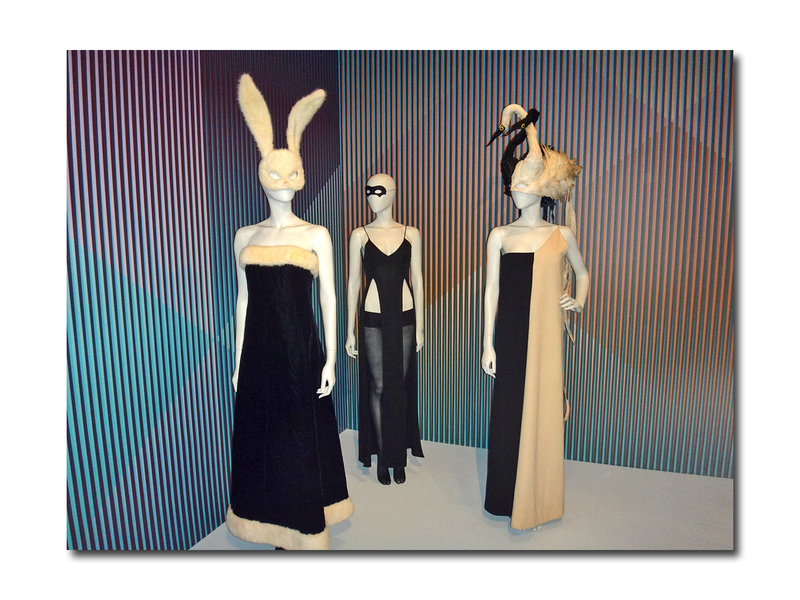 On display is the Halston dress and bunny mask worn by Candice Bergen, the James Galanos dress and Bill Cunningham black and white swan mask worn by Isabel Eberstadt, and the Betsey Johnson and Penelope Tree collaboration jersey dress worn by Penelope Tree. The late 1960's fashion mirrored the social upheaval of the Vietnam War and counterculture hippie protests against the establishment. 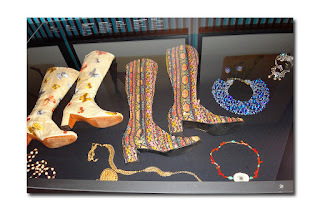 Pauline Trigere and Bill Blass struggled to incorporate the "do your own thing" vibe along with gender fluidity, psychedelic patterns, and wild color combinations. This marked an era with a theatrical aesthetic seen in Art Nouveau, as well as Indian and Middle Eastern textiles. 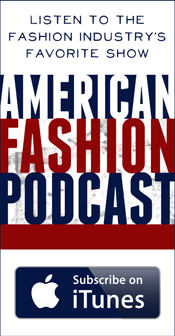 The American West was another big influence bringing denim, leather and even military dress to the forefront. Artisans opened shops in the East Village in abandoned spaces or out of the way spots, even influencing the House of Dior to focus on exoticism, romanticism, and fantasy. As the 1970's dawned, fashion saw a turn away from the more loose-y goose-y unstructured garments with a return to sleek lines seen in a menswear influence for both work and evening wear. Yves Saint Laurent's formal "Le Smoking" tuxedo as well as Ralph Lauren's menswear tailoring made pantsuits and trousers acceptable attire. The famous fashion show known as The Battle of Versailles in November 1973 showcased New York designers Bill Blass, Stephen Burrows, Halston, Anne Klein, and Oscar de la Renta against Parisian couturiers establishing American design firmly as a force to be reckoned with and reportedly even stealing the show. Eleven black models joyously walked the runways including Pat Cleveland, Bethann Hardison, and Alva Chinn, further stealing the spotlight from their staid French counterparts. In addition to the platforms with mannequins are several cases containing accessories of the various eras. I particularly liked the Youthquake case which featured various day-glo shades of hosiery, fishnets, and mod silver boots. In the case next to it are fashion magazines -- a Vogue cover, an ad for Scotch tape used to tape a short haircut when sleeping, and an article featuring "The Girl in the Black Tights" aka Warhol "It Girl" Edie Sedgwick. Copy from the article reads "This cropped mop girl with the eloquent legs is doing more for black tights than anybody since Hamlet." In another case I was excited to see a pair of tapestry boots in the exact same pattern as a vest that I recently purchased at a vintage sale. The tapestry actually looked quite familiar to me when I bought it -- I probably owned one very similar back in the day! 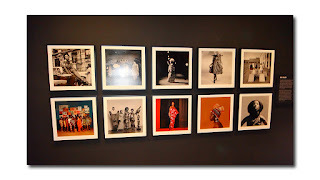 Also featured are documentary photographer Kwame Braithwaite's "Black is Beautiful" series of photos from the late 1950s and early '60s which helped to popularize an "Afro-centric vision of female beauty featuring un-straightened hair and dark skin." 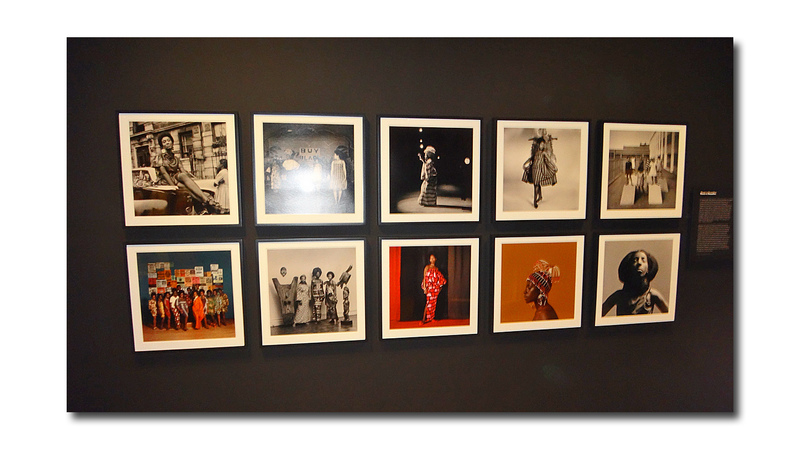 Tonight at 6:30, Braithwaite will speak about the photo series. 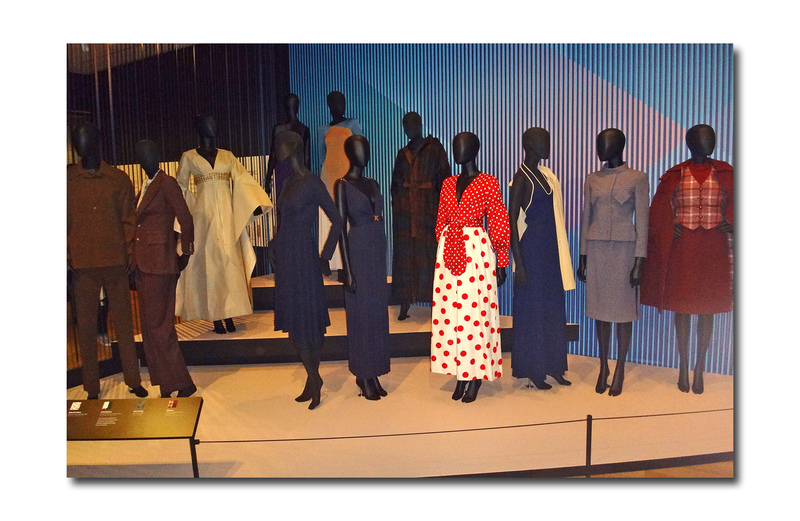 On March 14th join Anna Sui for '60s Fashion: The Youthquake and Its Aftershocks. For more info: mcny.org/mod.